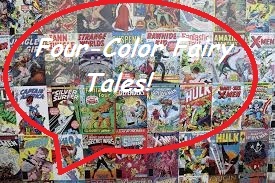 Fairy Tale Fandom: Four-Color Fairy Tales: The Fox and the Firebird. 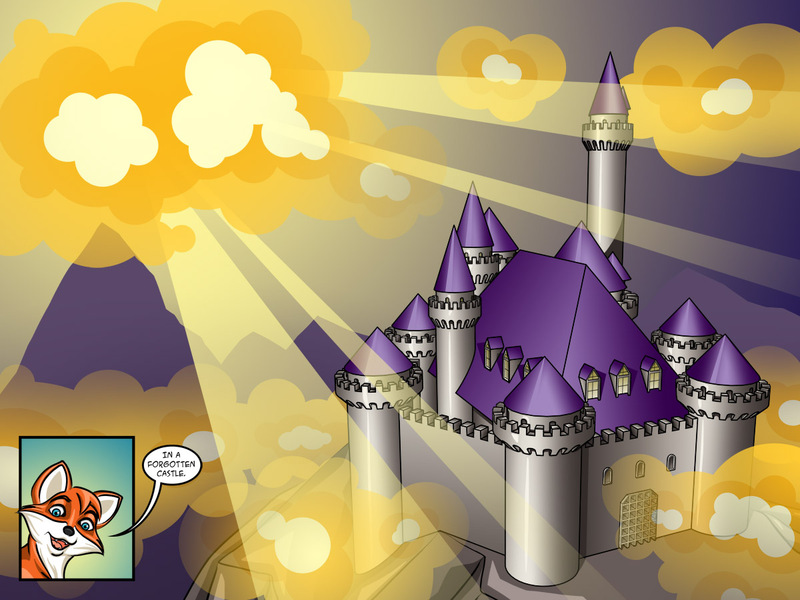 I’ve talked about webcomics a few times on this blog. Some are easier to talk about than others. 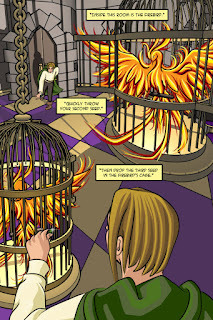 While it was easy to talk about Erstwhile as an excellent anthology adaptation and Meaghan Kearney’s Beauty and the Beast as an example of one story being expanded and fleshed out, I was never quite sure what to say about TheFox and the Firebird. 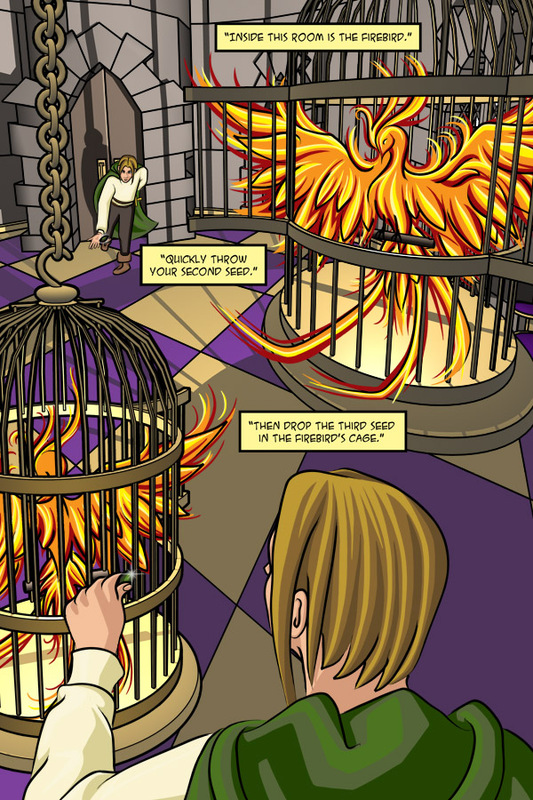 The Fox and the Firebird is a largely original story drawing on fairy tale elements. The webcomic is written and drawn by a woman named Marie August, who also appears to be the author of a couple of self-published YA novels. 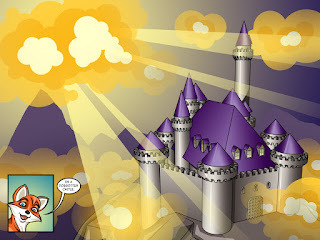 The story starts off with Prince Peridot of the gem kingdom going off in search of the legendary firebird to cure his ailing father who is dying. Peridot’s two older brothers had left before him and hadn’t returned. Along the way, he encounters a witch, the witch’s daughter, a talking fox, a sleeping princess and other assorted characters. These characters sort of extend and complicate Peridot’s quest as obstacles arise. It seems like a very story when I explain it like that. It’s clearly based on your usual “prince as hero” story complete with older brothers who don’t measure up. The fairy tale influences range all over the place. The Fox to some extent reminds me of Reynard the fox from the old French fables. The princess is partly “Sleeping Beauty”, but in the situation of being watched over by a monster like in tales like “Old Fire Dragaman” from the Appalachian Jack Tales (I can’t remember the titles of any of the European counterparts right now, but there are many) only this one’s a three-headed troll like one out of Scandinavian stories. Then, of course, there is the Firebird of Russian lore. I will warn you that there may be spoilers ahead. At first, I didn’t think much of this series. It just seemed kind of blah in a lot of ways. There was very little that made it stand out. However, after a little while, I found that the complexities of the various characters started to come out. This made the whole thing a lot more intriguing. While Prince Peridot seems to remain the standard prince of countless hero tales, everyone around him seems to be less and less what they seem. Early in the story, Peridot gets in a bind with a witch. The witch’s daughter Willow agrees to help him provided he takes her with him. He agrees, though he soon forgets his vow in his quest for the firebird. Willow’s presence doesn’t end there, though. She continues to watch Peridot and his companions and through various actions reveals her character’s nuances. She isn’t the prototypical evil witch like her mother but neither is she the good, meek girl she first appears to be. The Fox is similarly complex, as it’s revealed that he has a past in which he had another form that was not a fox. However, my favorite is probably the Princess Bellisima, if for no other reason than it plays with our modern expectations of what a fairy tale princess should be like. When we first see Bellisima, she seems like the prototypical beautiful fairy tale princess asleep in an enchanted castle. After Peridot wakes her, we see Bellisima come up behind the monster that is her captor and chop its heads off with a sword. Now, we get the idea that she must be one of those new-school adventurous princesses that will take up a sword and rescue herself from bad situations (On a tangential note: How I dislike the phrase “rescue yourself”. If you do it yourself, isn’t it much less a “rescue” and much more an “escape”?). However, over time her background starts to be revealed and we start to see that Belissima has a selfish side to her actions and that she may be much more of a flawed individual than the reader first thought. While there are any number of “not so righteous” princesses in folklore, very few seem to make it into fairy tale media. It feels like a really neat twist on fairy tale princess tropes both old and new to be reminded that just because someone is beautiful and capable doesn’t necessarily mean she’s a great person. Still, it’s not perfect. I’m not particularly crazy about the artwork. It tells the story okay, but something about the style bugs me. Also, sometimes August tries to use what seems to be the webcomic equivalent of double-page spreads (when a picture spans to pages of a comic book). However, the computer screen is not particularly adept at displaying this (see the picture below). I also recall the webpage the comic was on being hard to navigate, but now it looks like that’s been fixed. Overall, I wouldn’t say The Fox and the Firebird is a must-read, but it might be worth a look back on every once in a while. It may still have some more surprises in store for us.